Birthday Age in Alpha or Numeric form OR name (dependant on character space). For custom theme, words or colors, please contact shop first to discuss. Strawberrie Rose birthday tutus are a party and cake smash favorite! 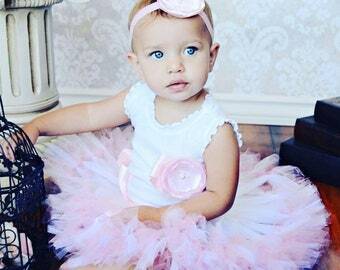 Our unique tutu outfits for little girl’s special events are handcrafted and completely handmade in Southern California. All Strawberrie Rose tutus are created with very high-quality fabrics and each tutu is a fluffy masterpiece designed exclusively for each little girl. 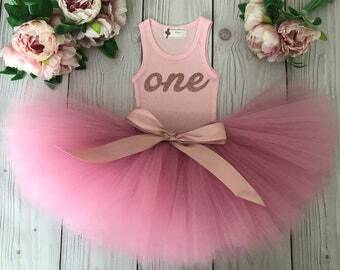 Our tutu outfits can also be designed in a cascade of colors to match you party theme. Please message us first to discuss a custom order. Tank, Short Sleeve or Long-Sleeve Bodysuit or shirt with your choice of a flower embellishment OR baby girls name. You can also contact us to discuss other options to match your specific theme. Any birthday crown or halo hair wreaths shown can be purchased in other Etsy shops. In some instances, it may no longer be available for purchase. Copyright © All items created, and images shown are owned by Strawberrie Rose and are registered and certified under US, and International copyright laws. Duplication is prohibited, and Strawberrie Rose retains all rights of reproduction. Images, content and design reproduction is not permitted, and images should not be taken without shop owner’s permission. The outfit was adorable! It arrived as promised. I highly recommend. 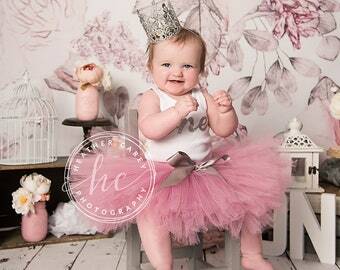 Thank you for making our little princess’ birthday outfit timeless! 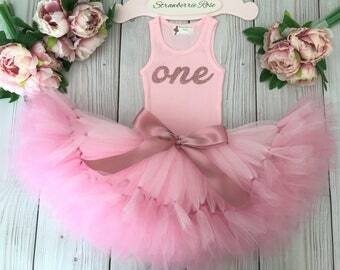 Perfect for our baby girls first Birthday!! Everyone loved it!! 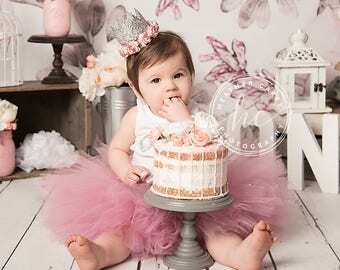 I accept custom tutu orders and can create tutus to match your party theme or color scheme. 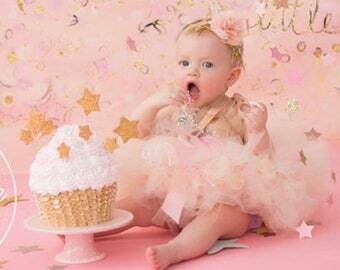 Birthday Tutu is true to size and is created on an elastic band which will stretch as little one grows. Please order by age unless little one is lower/higher on the percentile then order 1 size down or up. Recommend washing on delicate cycle or hand washing with woolite then allow tutu to air dry. Remove any embellishments prior to washing tank, bodysuit or shirt. Tutu is shipped in tissue paper. Gift card and wrapping available upon request for an additional fee. Wholesale is available upon request. 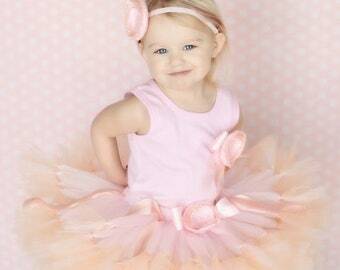 Rush orders on my tutu dresses for baby girls are sometimes available but will require a rush fee. Please message me to discuss a rush order prior to purchase. 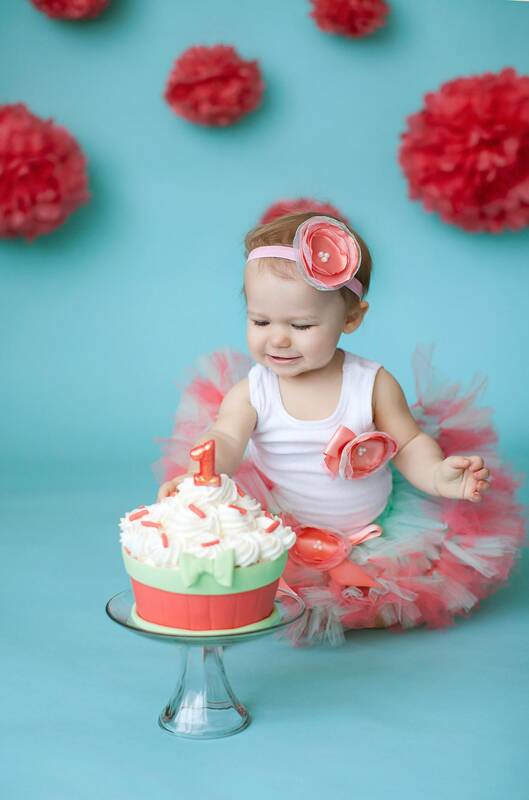 Yes, Strawberrie Rose ships tutus worldwide.